The Research Grants scheme was established to commemorate The Society’s Centenary in 1993. Under this scheme The Society currently anticipates awarding at least five Early Career Research Grants per year, and up to five Senior Research Grants per year, each with a value of up to £1,500, to support research on molluscs that is likely to lead to publication. The maximum amount available should not be considered as a ‘target’; rather requests for monies should reflect the research that is proposed. Early Career Research Grants are conferred on students and researchers without professional positions, but without regard to nationality or membership of The Society. Senior Research Awards are aimed at established researchers in professional positions, but without regard to nationality. Applicants for Senior Research Awards must be members of The Society. 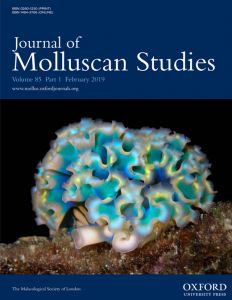 Preference for both award types is given to discrete research projects that fall within the subject areas covered by The Society’s journal, Journal of Molluscan Studies. Applicants should bear in mind these criteria when submitting an application. In addition applications will be assessed in terms of scientific merit, significance and justification of budget requested, and the degree to which the proposed research will benefit the scientific aspirations of the applicant. Successful applications to the Early Career Research Grants scheme that are concerned with the study of Bivalvia may be awarded as Sir Charles Maurice Yonge Awards. The closing date for the Early Career Research Grant scheme is 15th December. The closing date for the Senior Research Grant scheme is 15th June. Applications should be made by email sent to MSL_awards@nhm.ac.uk. Please include your surname and the award proposed in the subject line of the email. Applicants will be notified of the outcome of their application after the subsequent Annual General Meeting. The Society’s preferred method of payment is PayPal. Early Career Research Grants will be reviewed by MSL council members and Senior Research Grants will be reviewed by a Reviewers Panel including both council and non-council members invited for that purpose. Recipients of all Research Grants are required to submit a report to the Society within a month of completing the work supported by the award. This report should be written as an article of approximately 1000 words for publication in The Malacologist, the Society’s newsletter. Any delay or alteration of the work originally proposed should be notified in advance by email to the Honorary Awards Secretary at the above address. Financial support from the Society should be acknowledged in any publication arising from the research by including the following sentence in the Acknowledgements: “This study was partially funded by a Research Award from the Malacological Society of London”. (Replace “partially” with “entirely” if appropriate). For Research Grants, payment will be made to the successful applicant before the work commences. All sections should be use font size 11, apart from references, which can use font size 8. Section A – Complete all sections. Note that while previous funding from the MSL does not exclude further applications, applications from applicants that have not yet received MSL funding may be treated preferentially. Section B – The title should emphasise the core aspects of the research project to be undertaken. The proposed start date should take into consideration the fact that awards will be announced at the AGM, which usually takes place in March or April. The duration of the project must be given and awards are made for research taking up to 12 months. Provide a brief account of your research experience and explain its relevance to the proposed research project. If you have any publications, these should be listed in reverse chronological order (maximum of four publications for Early Career Research Grants; ten for Senior Research Grants); less established researchers applying for Early Career Research Grants will not be expected to have published work. Section C – Specify whether or not the research raises any ethical issues and whether all appropriate permits and licences have been obtained (Question C1). Note that proposals will not be funded unless this section is answered in a satisfactory manner. State the aims of the research project clearly and concisely and list its main objectives (Question C2). The ‘Project details’ (Question C3) should include background, experimental approach, an outline timetable, budget statement, expected outcomes and key references. It should also explain why the research needs to be done and how it will benefit the field of malacology. Note – this section should be written concisely and must NOT exceed TWO sides of A4. Applications where Section C exceeds two pages will not be funded. Funds cannot be used to cover salary costs. Letters of recommendation – These make an important contribution to the decision making process and should provide sufficient detail about the applicant and their project. Please include two letters. Where not a referee, supervisors should also send an email confirming their support of the project for Early Career Research Grants. The details of the persons supplying letters of recommendation should be listed in Section C. Note that it is your responsibility to ensure that the letters of recommendation are submitted, the Society will not contact referees on your behalf. Letters of recommendation should be submitted by email directly from the referees. Please submit your application by email to the Honorary Awards Secretary at MSL_awards@nhm.ac.uk, with “Research Grant Application” and your surname in the subject title. An application form for Early Career Research Grants can be found here. An application form for Senior Research Grants can be found here. These guidance notes are available in Word format from here.